The number of children from outside the U.S. adopted by Americans continued its steady decline in 2016, according to data from the U.S. Department of State. 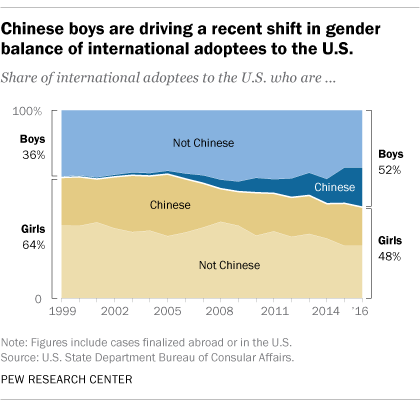 And for the first time on record, males outnumbered females among adoptees from abroad, a trend driven by changing adoption patterns in China. The decline in international adoptions has been driven by a significant drop in adoptions from the five countries where most international adoptees were born: China (which accounts for 78,257 of a total 267,098 adoptees from 1999 to 2016), Russia (46,113), Guatemala (29,805), South Korea (20,318) and Ethiopia (15,317). 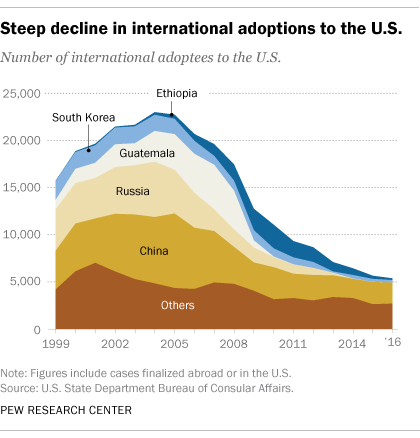 Together, these five countries have accounted for 71% of all adoptions to the U.S. since 1999, and they have driven 88% of the total decline since 2004. All five countries have revised their adoption protocols in recent years, making it more difficult for Americans to adopt from these countries. In Russia, a diplomatic rift with the U.S. led to a ban of new American adoptions of Russian children as of 2013. In Guatemala, reports of fraud and corruption within the Guatemalan adoption system prompted the government to suspend new adoptions from the country in late 2007. (The few U.S. adoptions from Russia and Guatemala that occurred after the bans were “transitional” cases – adoptions initiated before the restrictions were in place.) In China, South Korea and Ethiopia, the decrease in international adoption numbers reflects the tightening of domestic laws regarding adoptions in general. The Ethiopian government suspended all international adoptions in April. The number of adoptions from China has also declined sharply but still far exceeds adoptions from other countries. In 2016, Chinese adoptees made up 42% of all children adopted internationally by Americans. However, the demographics of adoptees from China have shifted in recent years. Most notably, males made up a slight majority of adoptees from the country (51%) for the first time on record in 2016, a stark change from 1999, when Chinese adoptees to the U.S. were 98% female. One reason for the shift in the gender of Chinese adoptees may be the recent easing of the country’s one-child policy, which contributed to the large share of girls who were put up for adoption in the past. According to the U.S. State Department, the pool of adoptees from China has also changed from predominantly infant girls a decade ago to being largely comprised of those with special needs or older children split evenly across genders. Increased efforts by the Chinese government to encourage domestic adoption and a stronger Chinese economy are largely responsible for the demographic shifts in the pool of Chinese adoptees. Because Chinese children make up a large share of adoptees, China has driven the broader gender shift across all international adoptees to the U.S. over the years. From 1999 to 2016, the number of female adoptees far outnumbered males, 61% versus 39%. Yet in 2016, 52% of international adoptees were male and 48% were female. Aside from gender, the average age of international adoptees has increased. Before 2008, the largest share of adoptees was those less than 1 year old (44%). Between 2008 and 2014, there were nearly twice as many adoptees ages 1 to 2 (39%) as adoptees under 1 year (20%). In 2015 and 2016, the largest share of total adoptees to the U.S. was considerably older, ranging in age from 5 to 12 (35%). Again, this trend is largely driven by China, where children put up for adoption are older than in the past. Despite the recent decline in adoptions from abroad, the U.S. remains the country that adopts the most children internationally. In 2015, the U.S. accounted for 46% of all adoptions among 24 receiving countries that are part of the Hague Adoption Convention. But the U.S. is also a source country for international adoptions. There were a total of 89 outgoing adoptions from the U.S. in 2016. Canada adopted 39 American children, followed by the Netherlands (25) and Ireland (13).